For height plus reach, consider a mobile cantilever platform. 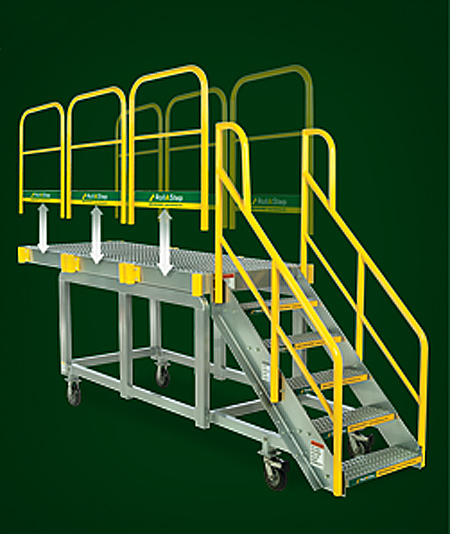 Allows operator to work above or step onto tall industrial machinery. Heavy duty steel base adds counterbalance weight for stability. Special tires and locking swivel casters. Heights from 8' to 12'. When you're ready to put a team to work on a tall project, choose these mobile work platforms for convenience, stability. Removable handrails allow open access to work area while remaining handrails help prevent falls. Deck heights from 27" to 72". Simply tip this work platform onto the wheels and roll it to a new location. Sturdy supports stabilize the platform while 2" handrails aid safe climbing. Unique side roll wheels allow four-way motion for excellent mobility. Deck heights from 24" to 72". Adjust mobile work platforms to whatever height you need. Self-leveling mobile work platforms easily roll into position with 360 degree swivel casters, quickly lock down, and adjust to optimum height with little effort. Maximum deck heights from 76" to 106". Learn more about configuring a custom mobile work platform to perfectly match the special task requirements you have. Custom platforms are engineered with durability and safety as top priorities no matter the style mobile platform you opt for.